So you want to help translate? If there is work to do, we will announce it via email and in the forum (So you might want to check out the post of your language here: http://forums.corsixth.com/index.php/board,11.0.html). Please let us know what you do, when you do, so we can keep track of the translations process and the status of all languages. This can (and should) happen via PM (to "Bluebaerry" or "SimplyRyan") or email. The first way is to simply get stuck in and start editing files, once you are comfortable we can provide access to the google code site and let you submit your files/updates directly. The second is where we provide you a little assistance, providing the text in a generic format via email which you return and we enter into the game on your behalf. We will dig a little deeper into the first way, regarding the other method feel free to contact us directly (via the forum messaging system) to get you up and running! Before we dive in lets touch on some finer details. text or changed existing text (due to technical reasons or features). For example the French language is in the original game but we have around 750 new lines on top of the original. We also have languages that weren't in the original game these include Russian and Dutch for example. These are 100% new to the game and at present stand at around 2,500 lines of text. The best way to get started is to start working on a local copy of the game language files, you can find the language files in the \Lua\languages\ folder where you installed the game. I suggest making a copy of the folder before you get started. 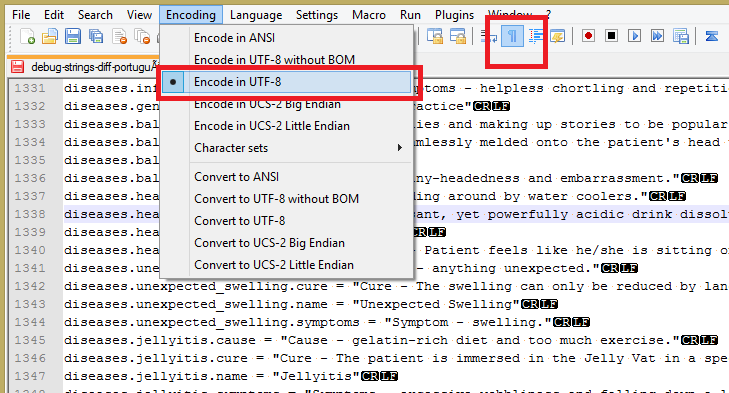 The image below shows where to set UTF-8, I also recommend setting “Show All Characters” this will show line returns, spaces and tabs – very useful! Once the above has been completed a series of debug files will be saved in the same folder as your save games (on Windows this is C:\Users\<your username>\AppData\Roaming\CorsixTH). misc.save_success = "Game Saved Okay"
misc.save_failed = "ERROR: Could Not Save Game"
The first part of the line is the variable used by the game, the text between the quotes is the actual text that appears in the game – sensitive to spaces so watch out! From here you can start to translate and saving any progress you make, changes here wont automatically go into the game to do that open up portuguese.lua and copy in the lines you translated (while you can enter the new lines anywhere it would be nice to put them into some kind of order – see the other languages for examples). Q: Do I need any special tools to help translate? A: Not right now, you can use any text editor that supports UTF-8. I personally use Notepad++. A: Wonderful! Firstly it's a huge undertaking as we have thousands and thousands of lines of text, so ideally we would like a few people to work on a new language, but don’t let the amount of text worry you - contact us and let's talk!